Thank you to avid FedererFan07 reader Nancy (for the article and wise commenting) for sending this in. This article addresses a different angle on tennis and sheds light on Roger’s efficiency in his game deeper than a casual conversation (smooth movement, graceful touch, on and on..). Written by Verlyn Klinkenborg (who also practices this principle in his own craft) back in 2007, during the US Open. Down on the court it is Roger Federer versus Andy Roddick, 10:20 p.m. on Wednesday, men’s quarterfinals at the U. S. Open, early in a match that is never as close as the score. The players are still just becoming themselves. Roddick’s spasmodic serve is clocking 140 m.p.h. — the final, great twitch in a motion that is all twitch. 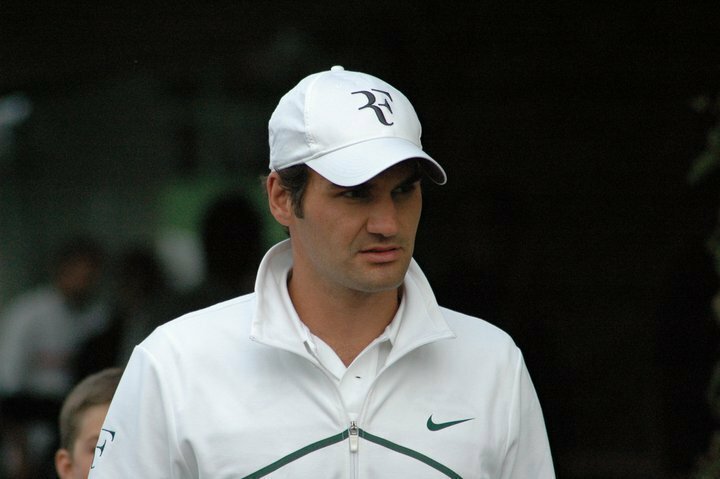 Federer has not yet been Federer, but he is about to be. In the next few shots the game switches from tennis to quantum tennis. Roddick hits shots to where Federer isn’t, only to discover that by the time he has hit the ball, “isn’t” is in the past. Federer hits shots to where Roddick can’t be, which is an entirely different thing. And sometimes he hits them to where Roddick won’t be, which is a psychological assertion and more damaging to the opponent. I try to imagine watching this match without seeing the ball going back and forth — seeing only the two men’s contrapuntal motion. One thing is instantly clear. Federer masters his opponent’s inertia. It’s as if Roddick is a weight on the end of a string and Federer is swinging him back and forth until he lets the string go and sends Roddick, who is playing at the top of his game, flat-footed into the far corners. I have watched lots of televised Federer — every tennis fan has — but only now, live, do I understand. I’m surrounded by tennis reporters, and they are giggling. Federer hits an improbably perfect cross-court backhand, and laughter breaks out. Our expectations are outrageous, and seeing them met is somehow uproarious. In the past couple of days, I’ve watched Djokovic, Monaco, Jankovic, Davydenko, Haas, both Williamses, and my favorite, Henin. The tennis has been wonderful, the athleticism extraordinary. And yet much of it has looked like a form of barely controlled rage. You can see it on the court now. Roddick explodes upon the ball. Debris flies in every direction. Federer’s motions look slight in comparison, and yet the ball seems to emanate from a single point with all of his focused energy behind it. It looks like sleight of hand. And one other thing I notice, which is the void that Federer’s best shots leave behind them. Here it comes, a forehand I won’t even try to describe, except to say that it trails behind it the wish — an aching desire, really — to see it again. I don’t mean in instant replay or slow motion on the stadium screens or later, at home. I mean going back in time to see the shot as if you’d never seen it before. It’s the most unsophisticated desire you can imagine — to make the short voyage from hope to joy all over again. Roger Federer. Greatness in Value.